If there is one thing that I have become passionate about in the past year or so, it is documenting the learning that goes on in my classroom. Not only have I found it to be a wonderful way to see just what the children are learning when involved in different classroom activities, but I have found it to be absolutely crucial when it comes to figuring out how to use or augment the curriculum to enhance and further the development of the children involved. For example, a little over a month ago (its probably been two months now) the children and I went outside to collect leaves for a project. One of the kids happened to look up and noticed the leaves that were falling off of the trees. Through asking open-ended questions I found out that most of the children in the class did not have the term “falling” in their expressive vocabulary (although it was present in their receptive vocabulary). Through documenting the children’s discovery and understanding of falling, as well as their ability to use the word as part of their vocabulary, I was able to come up with several different activities to enhance their understanding of falling, as well as giving the children more opportunities to use the word as they talk about falling. By documenting all of this information through pictures, quotes from the children, and my own observations, I am able to see the changes in the children’s understanding and development through time. Additionally, the added documentation will lead to more activities that will lead to more discoveries. I have often tried to explain to different teachers, as well as to parents, that – to me – documentation serves three purposes: it provides a timeline for development and a springboard for new activities for teachers; it provides the child with a set of “instructions” for how to revisit a project on their own; and it provides evidence of learning to the parent. The idea that the child can look at documentation and use it to initiate a self-directed activity is an important one. If a child is genuinely interested in a project, they will use the documentation to help them explore a project again and perhaps expand on the knowledge that they have already gained from the project. I have seen this in my classroom, where my children are currently experimenting with ramps and bridges. Each time that we revisit the project (or the children revisit it themselves), their understanding of why objects act the way they do on a ramp or a bridge deepens. I recently posted an article about observing during easel painting, in which I wrote detailed notes about what the children did, as well as what they said, while painting on an easel. This exercise was very eye-opening for me as I observed how the children interacted with the paint and the brushes, as well as how they articulated their thoughts about what they were doing. This information was priceless to me as I tracked their development, and the observations of the interactions led to more ideas for projects that would allow the children to explore with different materials in the same way that they explored with the paint. On Monday I introduced some laminated strips of black construction paper that we were going to use to make roads for the little plastic cars that I had just added to the block area. We made roads for about fifteen minutes on Monday, and the pieces of road went largely unused for the remainder of the week. That is, they went unused until Friday, when two of the children got them out and proceeded to put them together into a road. They worked together for a while, but they became frustrated when they ran their cars on the road and it wouldn’t stay together. So we got out the masking tape and they worked to tape the strips to the carpet. Several other kids had joined them by this time, and we all had a wonderful time taping the strips to the carpet. It was amazing to watch the kids concentrate on holding the tape without letting it touch itself, concentrate on trying to untangle the tape if it got stuck to itself, and concentrate on putting the tape on just the right spot on the strips. I took lots of pictures and am planning to do a very thorough documentation of the experience, as well as any similar experiences that come along in the future (because of the company I work for I do not post pictures on my blog, in case anyone was wondering). But as I was taking the pictures and reveling in how involved and focused the children were, it occurred to me that two of the participants will be moving to a different classroom in a few days. I will not be able to follow their progress in this activity any more; I don’t even know if they will be doing this activity in their new classroom. I remember reading during my investigations into Reggio Emilia that teachers there stay with the same class the entire time they are at the school. Children move from classroom to classroom every year, but the teachers go with them. This has so many positives, because teachers know so much about a certain child’s learning style and how they approach a project. The teachers learn about the temperament of the whole class, as well as the individual children. They are familiar with the interests of the children, as well as how they have progressed developmentally. If children have to have different teachers every single year, those teachers have to become familiar with new children all over again. Children also have to get used to new teaching styles, which can be a shock if the style is very different from the classroom they were in previously. It hurts my heart that I will not be able to follow the development of those two children, and I know that they will probably not experience the joy of the project that we had just worked on again. We have so much fun revisiting projects in my classroom and expanding on them any way that we can, and I saw aspects of their development that I hadn’t really paid attention to before. It has caused me to approach observation and documentation with renewed and increased vigor, and to plan projects intentionally. I can only hope that those two children will receive the same care and vigilance on the part of the teachers in their new classroom. Anyone who is anyone in parenting or education has read the Wall Street Journal article entitled “Why Chinese Mothers Are Superior“, and many of them have already responded to the article. I decided to respond to the article because it characterizes a philosophical debate that has been plaguing me for a while now: two differing and extremely prevalent discipline styles. The idea that there are two differing styles is not what has plagued me, but the fact that there aren’t many people who seen to understand that there are differing styles, or what the mentalities behind these roots are. For this reason, I applaud Amy Chua’s article for bringing this to light. There are two different mindsets about children that are the root of these philosophical differences. The mindset showcased in the article is that children are inherently bad; if left to their own devices they will choose destructive, lazy, or hurtful activities. For this reason their activities and entire day must be micromanaged by adults, whether it be parents or teachers. This mindset is prevalent in our society as well as Amy Chua’s, although it doesn’t manifest itself in quite the same way. I will explain what I mean in a minute. The other mindset is that children are inherently good; if left to their own devices they will choose activities that are meaningful to them and that they will learn something from. Because they are children and don’t have all of the answers when it comes to the world around them, the adult’s role becomes that of a guide who helps the child understand the world around them, including how to interact with the people around them in a positive way. There is a world of difference in these two mindsets, and the differences have been made startlingly clear to me in a couple of different ways in the past month. I have been striving to act more as a guide to the children in my classroom, especially in the area of social skills. Rather than reprimanding a child when they do something hurtful to a classmate, I have started using these as “teachable moments“, explaining to the child why an action was not acceptable and informing them of a different way they could have dealt with the situation that would have been more positive. Now, note that I said that the child did something hurtful to a classmate. This does not mean that the child went out of their way to be hurtful to someone. If we only look at a child that hits and not at the reason for the behavior, we will never teach ourselves or the child anything. Through my observations of children with “discipline problems” I have found that every problem has a specific reason behind it. Granted, I have been observing for about six months, which isn’t a long time. I can’t say that I have all of the answers for every child. I can only speak about what I have personally dealt with. But every child that I have dealt with does have a reason for their actions. One child hits their friends and throws toys at them for apparently no reason. Upon observation I noted that this child did these things because something didn’t go their way and that was their way of dealing with it. The way I handled the behavior was to teach the child anger management techniques and talk to the child about alternatives to that behavior. It has helped tremendously where time-outs and even “say you’re sorry” have not. The setting for the first moment I went through in recognizing the stark difference in these two mindsets, as well as how prevalent the “children are inherently bad” mindset is, was at a training session about discipline. New state guidelines about discipline had been put into place and we were being trained on these new guidelines. When reading from the script, the presenter talked about the proper way to talk to the child and using using positive guidance. But when it came to discussion about the topic (and there is always discussion when it comes to discipline) the presenter seemed to get off track. There was discussion about how to handle a child who seemed out of control: attempting to stab with scissors and throwing around furniture. Rather than discussing the methods of the teachers, the presenter and those involved focused on the behavior of the child, and revealed that the child had been dismissed from the center (the presenter was the director of the center) due to the behavior. What hurt my heart was that those involved in the discussion did not talk about trying to find out what the underlying causes of the behavior were; it was assumed that this was how this particular child was – this child could do nothing but exhibit destructive behavior. I was completely taken aback by this mindset; it is very hard for me, as a teacher, to imagine another teacher not trying to find out if there may be something else going on with this child and if they are dealing with that the only way they know how. It is hard for me to see a child labeled “bad” when every child has potential and every child that I know wants to use that potential; some of them just don’t know how and need the guidance of an adult. The second eye-opener came at my own center, where I had implemented a discipline system in my classroom which was based on teaching correct behaviors rather than punishing bad behaviors. If a child did something hurtful to another child, I would pull both children aside and address the victim first. I would teach them to let the offender know that they did not like being treated in the way that they were treated. I would then explain to the offender that they had hurt the other child (most children really do not understand that feelings and actions hurt), teach them how to correct the hurt, and also teach them a more appropriate way to handle the situation that they were reacting to when they hurt the other child. This method had been wildly successful in my classroom for a couple of months, with children taking responsibility for their own hurts and actions without my involvement – and these were three-year-old children! Another strategy that I was employing in my classroom was child-directed activities, which made the children in my care much happier and cut down on discipline problems as well. This strategy had been in place for about a month when I was called into the office and told that my children were undisciplined and my classroom lacked structure. I was thoroughly taken aback and when I tried to explain the systems that I had put in place and how they were helping the classroom I was told that my philosophies weren’t in line with the company’s philosophy (the company’s philosophy is based on Reggio Emilia, so you can only imagine what impact those words had on me, who was trying to make my classroom more child-centered while staying in the company’s Reggio inspired curriculum). Because of these moments I have felt the clash of the two discipline styles personally and I have seen the effects of both on children. I have even spent the last month implementing a more micro-management-type style into my classroom, only to be thoroughly disgusted with the results, which have been an increase of discipline problems and a lack of general enthusiasm for being in the classroom on the parts of both the children and myself. My belief is that children are inherently good, and they hold a special wonder for the world around them. They will do whatever they can to figure out the world around them, and that may manifest itself in ways that may seem destructive. The key to figuring out what is behind a child’s actions is objective, unbiased observation, and the key to correcting behaviors is positive, educational guidance. That is my belief. When I first heard the term “child advocate” I was in agreement with the terms of the phrase, but I never thought that I would feel like I needed to be a child advocate when it came to teachers. Apparently there is a huge need for advocates for children in the realm of the teaching profession, because I am seeing time and again that children are “bad until proven good”. It is time to turn this belief around and help teachers realize that children are only trying to figure out the world around them, and our job is to help them in their discovery rather than label their attempts as “behavior problems”. I am starting to think that, if there really is such thing as a calling, this is mine. 2010 was an awesome year, in that I learned more about what it is that I do than I had in the past three years combined. The past three months has been a huge period of growth and maturity for myself as a teacher, but I would still describe myself as being in the “young-adult” years of my teaching career, in that I am trying to fine-tune my teaching philosophy and implement all of the wonderful things that I have learned. I will look back on 2010 as being a time where I soaked up so much knowledge so quickly that, even though I was mentally exhausted at times, I still kept pressing on, impressed by all of the amazing things that I was learning. I read some very informative books, a lot of which I will keep around so that I can dive back into them for some inspiration when I feel the need to. My first goal for 2011 is to continue to expand my knowledge about progressive and Reggio-Emilia inspired teaching practices. I am well on my way to achieving this goal already, since I received some wonderful resources for Christmas that will help me attain this goal. Developing a system by which I will offer the children in my class real and tangible things to experiment with and discover. I will find ways to display these items in ways that will inspire the children to experiment and create with the items that I offer the children. Develop a better documentation system that will not only better inform the parents as to what their children are learning and accomplishing in the classroom, but will inspire the children to continue to revisit, experiment, and discover more about the projects that we undertake. Make the families of the children in my care more a part of the classroom than they are now. Make them feel like they are welcome and included in the classroom environment. Find a way not just to inspire more parental involvement, but to make the parents and the children feel more like the daycare is an extension of their home rather than an entirely separate place that the children go to for a huge block of their day. Make the day less regimented than it is now, which will make transition times less of a stressful time, not just for myself but for the children as well. Give them more options, and make the things that they like doing (such as painting) more accessible to them so that they can do it whenever they want to. There are others, I’m sure, but these are the main ones. I would like to see more parental involvement and more knowledge given to the parents of what we are actually accomplishing in the classroom. I would also like to see the children given more opportunities to explore and experiment, and more items to do that with. I know that with the ideas that I am trying to implement, 2011 will be a great year as well, perhaps even greater than 2010. Throughout my research into the Reggio Emilia approach to education, I have heard stories of how teachers using this approach constantly reevaluate how their room is being used, how the centers are being used, and what the children’s interests are. I have also seen pictures of how uncluttered and streamlined their classrooms look. Both of these points have caused me to look at my room differently and reevaluate the centers in my own classroom. Today I did a major overhaul of two centers. My art center has always looked cluttered. The shelves were more like small cubbies, just big enough to slide papers in. It may have been a mailbox shelf for teachers at one time, as a matter of fact. My biggest goal for this week was to switch out this shelf for the one in the science area so that the art supplies would be open and more accessible to the children. I have the pencils, scissors, crayons, and collage materials in individual pencil boxes on the shelves. Paper is on the shelves also, as well as magazines that the children can cut pictures out of and use them to make collages. Tomorrow I will fill the glue bottles up and put them on a shelf as well, so that they will be there for when the children want to make collages or whatever. The science area now has the cubby-like shelves, and while I don’t really like that shelf at all any more (initially I had begged to be able to keep the shelf, because I thought it would make a great art shelf) I am stuck with it for now because I have nothing to replace it with. So I will see how it works where it is for now, until I can get something better. I wanted to change out my manipulative shelf for a shelf that the school-age teacher had, but all of her shelves match so she was loathe to give any of them up. She had a couple of shelves that were lower, which I thought would be good for my kids, but we have used what we have and have been fine with it. But the top of the manipulative shelf is completely cleaned off now – no more clutter! Actually, there were toys on the top of the shelf, but it is very hard for the children to reach them when they are up there, so I think that I am going to get a plant or something to put on top of that shelf. So I have a couple more places to clean, a couple other shelves that have become catch-all spaces for me. I will have to retrain myself to not use these places in that way – it is hard because I don’t have a lot of storage in my classroom! But the top of the manipulative shelf looks so good that it is inspiring me to clean up the rest of the room! I haven’t had much of a chance to work my way through much of this book yet, what with holiday plans and all. But today I had a whole hour and a half free to get somewhere in it. The first section is about spaces, namely the layout of the rooms and how they speak of your commitment to children. Are the majority of fixtures in your center at the children’s level or the adult’s level? The sinks and mirrors in the bathrooms? The windows in the classrooms? What do the items in each center say about your view of children? Do they say that you view children as competent individuals? I have not even begun the process of writing down my answers to these questions, because the book first asks you what the centers should look like in general. Then it asks you what your centers would look like if you had unlimited resources. I am looking forward to answering these questions, because they will give me a foundation for answering the questions about the room I am in now. Being a teacher and not a director, I don’t feel like I can speak for the entire center, but I’m sure that I can make suggestions. The book speaks mainly to the entire center, and it would be nice to go through the book with the entire center in mind, but I am not in a position to make the necessary changes in this particular center. I am in the position, though, to design my own center with everything that I would like to see in it, and this is probably what I will do. It is a project that I will definitely look forward to. I am also looking forward to answering the questions about my own room. Just answering the first set of questions gave me the inspiration to get rid of the “Little People” town that I have had on one of my tables for about a year. Before that it had an assortment of plastic dinosaurs and other animals. Now I have no idea what I am going to use this table for. It is a pretty big table, with a one-inch wooden lip all around the edge. I am thinking about incorporating it into my studio area and using it for my studio enhancements every week. My studio area needs a lot of work anyway, including an entirely new shelf – I don’t feel like anything is open enough with the shelf I have now. This shelf is about four feet tall and is comprised of shelves that are about ten inches wide and three or four inches tall. Right now I have paper in the openings on the top level (there are four openings at each level) and pencil boxes holding writing tools or collage materials in the other openings. But no one can see the pencil boxes all that well to see what is in them, so the majority of them never get used. I want to change that. There are a lot of things in my room that I want to change, and it will take time to change them all. But I’m looking forward to using this as a learning experience so that I can use the skills that I learn for my own center in the future. One thing that the book did say was that for each group of children, the room (center) won’t be the same because the room (center) evolves in a way that will work with the tendencies and personalities of each group. It will be fun and challenging to put all of this into practice. I wish, however, that I had an assistant of some sort that I could collaborate with – two heads are better than one when you are talking about the personalities of children because one teacher may have noticed things that the other teacher hasn’t. And in centers in Reggio Emilia (the town) the teachers do collaborate when it comes to figuring out the best way to use or re-design a room. But in any case, this is proving to be a very exciting and engaging read, and I look forward to posting more about my progress in the days or weeks to come. Usually I do book reviews, or book reports – depending on how in-depth I want to go when talking about a particular book. In this case, I can’t do that because I haven’t read the book yet. 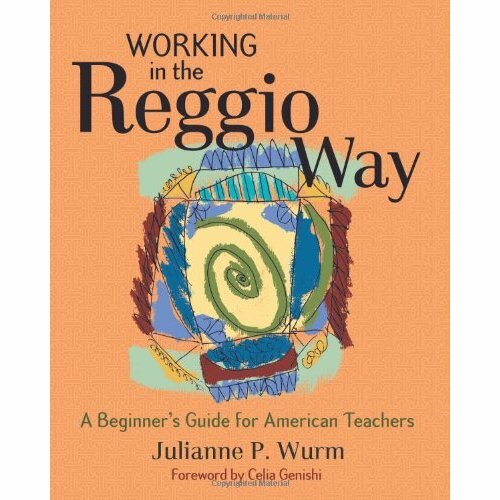 I recently bought the book “Working in the Reggio Way: A Beginner’s Guide for American Teachers”. I opened it last night, thinking that I could finish the book in one sitting since it isn’t very thick, but to my surprise and excitement, this book requires a lot of personal reflection into your views of children and education. I hope to be able to share some of my reflection here on this blog, and I hope that there are some out there that will join me in reflecting on just what our role is as teachers and what being teachers means to us. At first glance it seems that it will be quite a journey. After this last round of research, in which I have basically brought into focus what is actually supposed to happen in a Reggio Emilia-inspired school, I have discovered a better appreciation for what it is that I, as a teacher, am supposed to be doing. Wow, what a difference. It has been said that I come up with some of the cutest projects for my kids, but throughout this research I have been left wondering what they actually learned through those projects. And this may seem like sacrilege to some teachers out there, but I did very little of the typical Thanksgiving activities with my kids this year. Why? What would they learn? Three year olds can’t understand the concept of a Pilgrim or a Native American. They may understand to some degree what it means to be thankful, but is it really worth the heartache of making them sit still while you are trying to explain it to them? And how in the world do you explain the concept of “being thankful” to a three-year-old, anyway? Their time and mine would be better spent working on something concrete that they can grasp, or working on something that they can create for themselves. Or working together on projects that the kids come up with. After all, what could be a better way to learn how to be thankful than to examine the emotions felt when another child or a teacher helps you with something you are having difficulty with? This research has caused me to examine the abstract and complex, and contrast it with the concrete. From my limited knowledge of epistemology I understand that abstract principles are built upon concrete principles. If we don’t go through the process of helping children define the concrete, how in the world are they ever going to be able to build upon them? This is one of the things that I love about emergent curriculum. It involves children researching things that they are interested in, experimenting with those things, developing their knowledge about those things, and changing their perceptions based on the results of their research and experimentation. They build on their own knowledge, and through that process they develop the skills necessary to question and learn about anything that they want to throughout their life. I am constantly and consistently amazed at the stories I am coming across during my research of Progressive early childhood education. My research has been focused on the Reggio Emilia educational approach today, as I discovered that this is the approach that the company I work for is implementing. Funny that I didn’t realize this before, what with all of the curriculum trainings I have been through during the past two years; I had to go on their website to discover it (once you put a name to it like “Reggio Emilia” the easier it seems to be to implement it correctly). Not to worry, though – my research has born wonderful fruit. In short, I have figured out that I have a LOT of work to do on my classroom, but I already knew that. I have been spending most of my holiday time trying to come up with better classroom organization techniques, and these photographs and the knowledge that I have gained so far have helped immensely.